Sometimes life gives you lemons, and sometimes life gives you a three-day, all-expenses-paid trip to the United Arab Emirates, where you get to rub shoulders with Nobel Laureates, astronauts, musicians and close to 200 students from the top universities in the world. 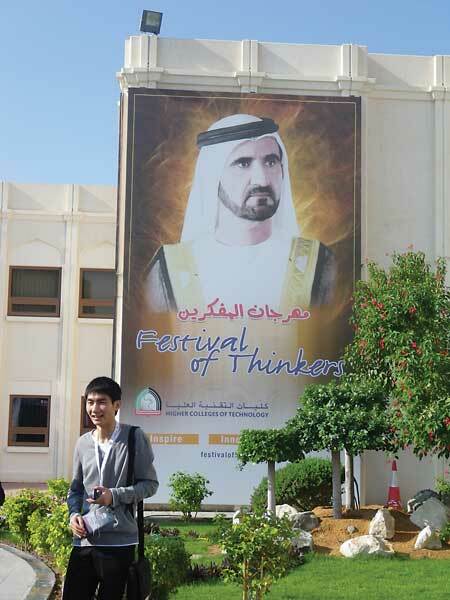 Masters students Julie Anne Ames and Josée Méthot report back from Abu Dhabi's Festival of Thinkers. 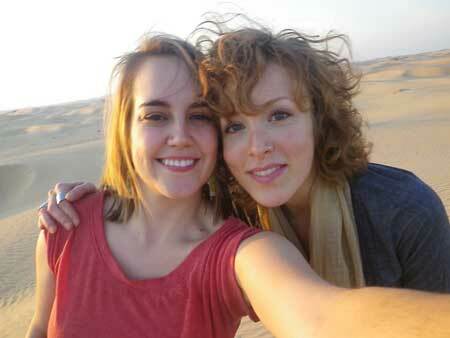 Mcgill Master’s students Josée Méthot (left) and Julie-Anne Ames (right) during a trip to the desert. Sometimes life gives you lemons, and sometimes life gives you a three-day, all-expenses-paid trip to Abu Dhabi in the United Arab Emirates, where you get to rub shoulders with Nobel Laureates, astronauts, musicians and close to 200 students from the top universities in the world. The Festival of Thinkers, a biennial event that began in 2005, is designed to gather a critical mass of great thinkers and students to discuss ways of fostering creativity at both scientific and social levels. Participants are encouraged to work together using lateral thinking while designing possible solutions to the world’s major challenges. Organizers of the 2011 Festival – held this past November – targeted graduate students from the top 80 universities in the world, and sent a last-minute invitation to cover all funding besides travel for two McGill students. This was our first time in the Middle East, and there was a steep learning curve. The founding philosophy of the Festival of Thinkers, organized by the Higher Colleges of Technology, is to energize promising youth to inspire, innovate and invent. This year, roughly 180 students from universities in Asia, Africa, Europe, the Americas and Australia gathered to discuss issues ranging from the current economic crisis and global environmental sustainability, to poverty, food security, education, technology and the arts. During one panel session, Charlie Duke, an American astronaut who walked on the moon during the Apollo 16 mission, spoke of how, when looking at the Earth from space, politics become fiction and geopolitical boundaries dissolve. Duke said that our blue planet becomes just another lonely ship floating through space – the human lifeship. As we all sat entranced in the presence of a man who walked on the moon, Duke explained that if you aren’t an environmentalist before going to space, you certainly come home one. Apart from lively discussions, roundtables, and intense international networking, several events took place at the spectacular Emirates Palace. The Palace is home to the only ATM in the world that distributes gold bars; just in case you are walking through the lobby and notice you are short a brick or two. On the evening of Nov. 15, Sheikh Nahayan Mabarak Al Nahayan hosted a lavish, eight- course meal under the open sky, accompanied by live circus performances, traditional dances, Emirati hip-hop and two firework displays of mind-blowing orchestration. There was even a red carpet – a definite surprise for students used to laboratories and libraries. Abu Dhabi is not known for subtlety– luxury vehicles purr across impeccable freeways and the city’s skyline is spotted with cranes erecting marvels of modern architecture. Indeed, the extravagance of oil-rich Abu Dhabi and the 2011 Festival of Thinkers stood in stark contrast to a key message of the conference: that we need to create a sustainable, just and flourishing world. For us, the experience was a lesson in contrasts. For example, a panel on the global economic crisis saw former Kentucky Governor and Kentucky Fried Chicken entrepreneur John Y. Brown argue for entrepreneurship as the engine of economic growth, while Dr. Fidel Castro Diaz-Balart, scientific advisor to the Cuban State Council, argued for an economy grounded in the production of social welfare. We met inspiring peers from around the world, and as we all tried to think our way through the complexities of the global challenges that face us, our conversations often turned toward the need for action. Together as students, we share much in common with our peers, regardless of borders. All in all, the Festival of Thinkers was a fantastic opportunity for learning, free thinking and collaboration in an exotic and exciting environment. On the flight home to chilly Montreal, we were still trying to process the experiences from our whirlwind trip to Abu Dhabi. In the span of five days in the United Arab Emirates, we had rode camels, met astronauts and Emirati royalty, brainstormed with incredible students from around the world, and began to chip away at some of the world’s most pressing puzzles. We are hopeful that these lessons and connections will snowball into real change. Julie Anne Ames is a Master’s student in Geography. Josée Méthot is working on her MSc in Natural Resource Sciences (Faculty of Agricultural and Environmental Science). Both are affiliated with the McGill School of Environment.